My column this time around isn’t about my previous or upcoming season, but about my experiences in motorsport in general. And how in my opinion the position of women within the paddock, in particular (aspiring) riders, can be improved. The reason for this is the announcement of the ‘W Series’, a championship for 20 hand selected women to ‘find potential future Formula 1 stars’, with a prize purse of a whopping 1.5 million dollars. The thought behind and purpose of the series is great: getting women on a more equal ground with men. The way they want to achieve this purpose however, can be much better. I’ve been against a separate girls/women series even since before I started racing myself. Primarily because it is completely unnecessary, a fact that no one can deny anymore after Ana Carrasco’s world title this past season (but there’s been many examples throughout the years: Carrasco and Herrera in Moto3, Melissa Paris in AMA and a World Supersport wildcard, Elena Myers with her AMA Supersport wins and Superbike campaign, Katja Poensgen in GP250, Jenny Tinmouth in BSB, Nina Prinz in IDM and a Moto2 wildcard, Carolynn Sells with her Manx Grand Prix win, and the list goes on). Beyond it being unnecessary, I believe a separate class definitely doesn’t solve any of the problems we face in motorsport, and will worsen them if anything. The women’s race is and will forever remain the B-race in the program, regardless of how hard fought the win may be. The biggest problem you face as a woman in racing, is the wrong mindset (which is funny because mindset is always the biggest obstacle for anyone on their road to the top, just to a lesser extent). This mindset issue comes from the way you are raised, your team, the organization, the other riders, (potential) sponsors, and even the fans. To start you will most likely not be treated the same as a young girl growing up versus a young boy: you’ll be handled with a lot more care (I’m lucky in this department, as my parents encouraged me climbing trees, playing football with the boys, etc). Often this means motorsport is never considered an option, but even the girls who do start out with for example minibikes aren’t encouraged like boys are. Simply participating is seen as an achievement. Do you want to win? In most cases you will not be offered help or an opportunity to learn, instead you’ll be told to stop making wild statements and start being content with 5th or 10th position... because ‘you’re already the best girl, right?’. Or my personal favourite: sponsors and teams that won’t give you an opportunity because they once helped a girl, and she turned out to not be that good of a rider. Because yes, you will get more attention which seems nice on the surface, but if you’re racing in the back of the field suddenly it’s ‘I told you so, women can’t race bikes!’. Even though you’re still amongst and in front of a couple of men in the back of the field. Organisations might even attempt to refuse your entry from time to time, regardless of how much you’ve already proven yourself in a similar class/field. 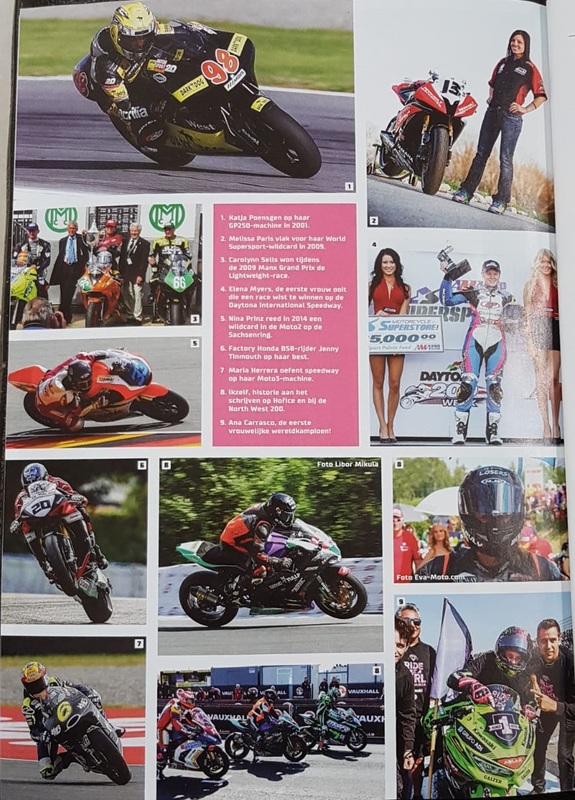 Not to mention the fact that at least 75% of the paddock will try and talk you into bed… if I had a penny for every time I heard ‘oh I’ve never met a girl who likes bikes as much as me’ I wouldn’t need any sponsors at this point. Don’t get me wrong – being a woman in motorsports really isn’t all bad. However, I do understand why many girls and women quit (long) before reaching their goals, or before they’ve even set any goals. Because it’s incredibly hard work to have to constantly fight to prove yourself as an equal to the male competition. This mindset issue will not be solved by creating a separate women’s class. It will be solved by accepting and believing that girls and women are capable of winning, and training them to be the best rider they can be as an individual. Then watch them shine! Make sure they’re racing against the best in the world from a very young age, and sooner or later one of them will reach the MotoGP class (or Formula 1). The greater the number of girls that start racing early on, the greater the chance of one of them reaching the pinnacle of motorsports. Do you want more female riders? Media can make sure that those who achieve the best results will be in the spotlight, instead of the best looking. Circuits and organisations can lower or even scrap entry fees. Factories can discount race bikes or parts. Teams, coaches, and parents will have to push girls in the same way they would boys, and expect similar results from them. All better ideas than ‘ladies cup’.